Since it was relatively late and I had a long drive ahead of me to get home, we agreed on a 25 point game (one of my favourite point levels, actually!). We played on a table already set up for “Balance of Power” (a central 6×12″ zone that gives 1CP for controlling and 2CP for dominating, and 2 flags which remove CP from your opponent if you dominate the friendly one). 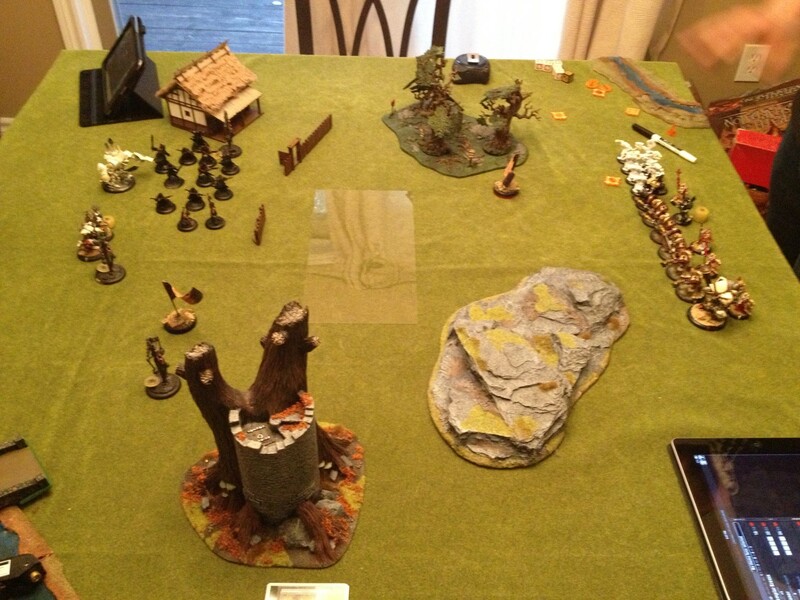 Not a bad scenario for 25 points… not great, but not bad. I like this list for several reasons. First, it doesn’t include Choir… a very neat decision considering that it’s not imposed by Tier-requirements or anything like that. Second, the inclusion of the Idrians is neat because they’re pretty much reviled on the forums but I’ve always thought they can probably get a lot of work done… sure, 13 points is a steep barrier compared to our 10 point Errants or 8 point Bastions, but by the same token “Prey” is incredible on POW11 rifles, and CRAs are really powerful in the right circumstances. Not a list that will set the world on fire, but I was pretty happy with how it worked out… a small unit of Zealots to screen the approaching (and slow) Bastions while I keep the Reckoner and Redeemer ready for assassination threats or to remove key pieces, as is required. We rolled for initiative, which I won and chose to go first. Darrell picked the side of the table with protective walls (probably wise?). 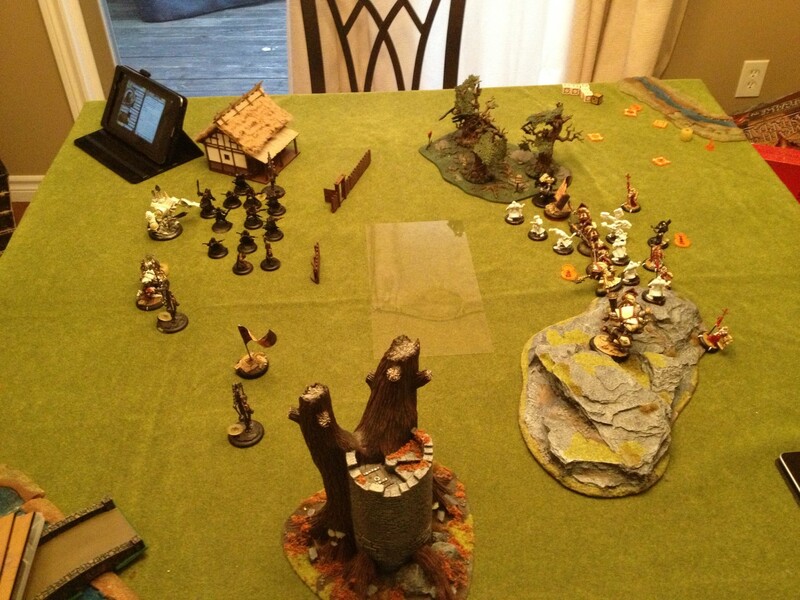 I deployed my troops in a long line (still necessary as I learn how to actually “unfold” my deployment… I miss my old Brick deployment style, but that requires WAY better capability to handle a first turn than I have!). The Zealots went on my right side, followed by the Redeemer and Kreoss near the middle (with the Choir behind, obviously), Then the unit of Bastions and lastly the Reckoner out on the left flank. Darrell’s deployment was more indicative of a man who knows his army well… his Avatar of Menoth (which looks SO MUCH BETTER than the default sculpt… I am absolutely going to steal 95% of his modifications… making the arms and legs slightly longer, swapping the sword for that of “Scourge of Heresy”, and maybe even removing the cloth talbards… or replacing them with those from “Blood of Martyr”‘s… anyway, I really like his Avatar much better than the stock option!) went across the table from Kreoss and the Redeemer, while the Devout and the High Reclaimer went closer to the middle of the table. 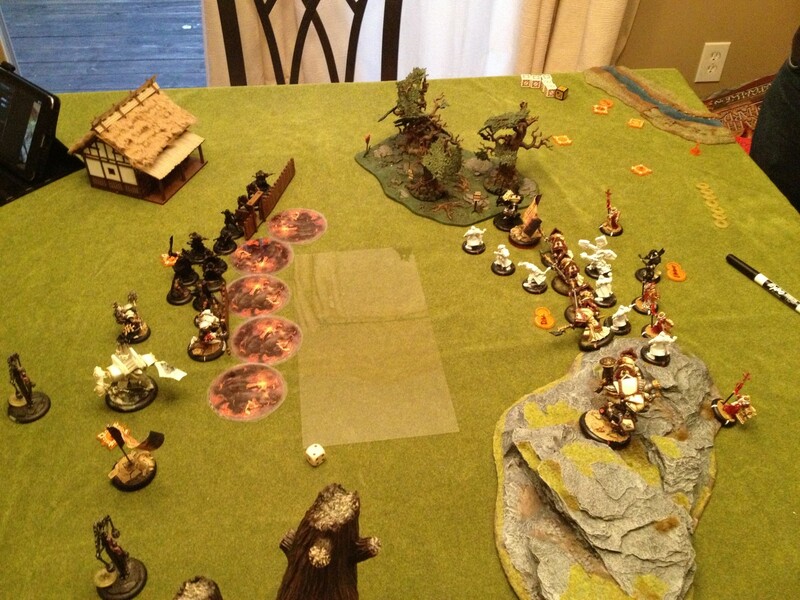 His Idrians went in front of the Avatar, loosely spread out (probably to reduce the risk of a single lucky scatter obliterating too many of them before he had a chance to activate the unit! ), and the Wracks were scattered with one to the right, one near the middle, and one near the left. Lastly, the Idrians declare that the Zealots will be their Prey. Kreoss starts by allocating 1 to each of my warjacks. No surprise there. The Bastions activate and run forward, spreading out a little. The Reckoner runs up that flank, and then the Redeemer runs forward between my flag and the forest (just staying with his toes into the forest, just in case the Idrians try to put some damage on him). The Zealots activate next and run forward, most of them stuck behind my Bastions (which I kept too close together), but a couple managing to get forward through the flag (thank Menoth those things are incorporeal!). 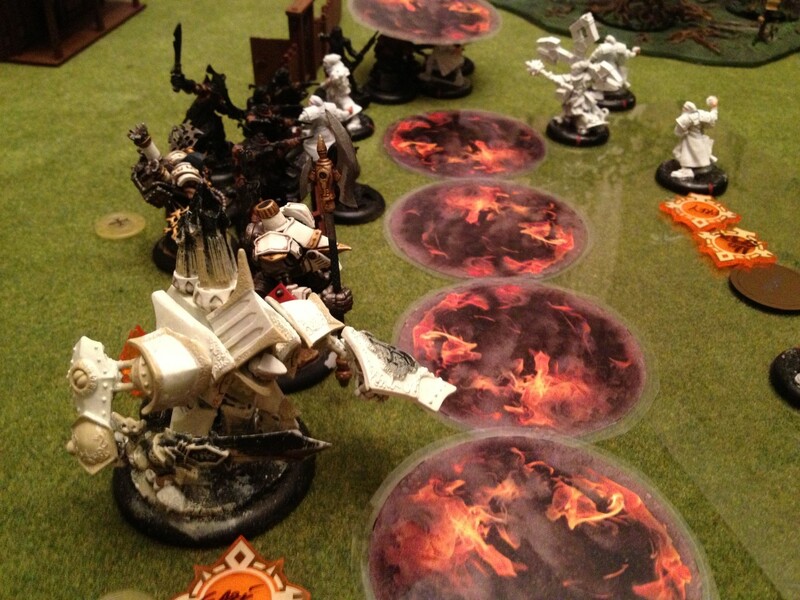 Kreoss goes next, walking forward and casting “Lamentation” on himself (very useful spell against a Focus 5 warcaster!) and “Defender’s Ward” on the Bastions. He camps his last Focus. Lastly, the Choir activates, walks forward, and tries to cast “Passage” on my warjacks, but only gets the Reckoner in range. I’m really sloppy with my first turn Choir activations… gotta get better at those! Anyway, with that the turn is over! Darrel gazes upon my swarm of fanatics with a steely stare. The Devout gets one Focus, the Avatar generates 3, and we’re ready. The Idrians go first, running forward a little, spreading out (mostly) behind the walls, and “Going to Ground”… bah. That’s an brutal rule against a Redeemer, I tell you what! Oh well. The Avatar runs towards the right flank (opposite my Reckoner), while the Devout runs forward and just toes behind the wall. The High Reclaimer walks up and drops 5 clouds (which Darrel got from a No Quarter magazine and I think look stunning!) in front of almost all his army… he needs to pull a Focus from a Wrack which explodes, and then prepares for my rebuttal. See, reading the card to know that the High Reclaimer can lay down 5 clouds a turn… that would’ve been smart! Oh well… there are ways around that… but coupled with immunity to blast damage? Problematic… oh well. Let’s see what we can do! Kreoss starts by giving 3 Focus to the Redeemer, 1 Focus to the Reckoner, and upkeeps Lamentation and Defender’s Ward. The Bastions go first, running forward and spreading out to allow my Zealots to get forward. 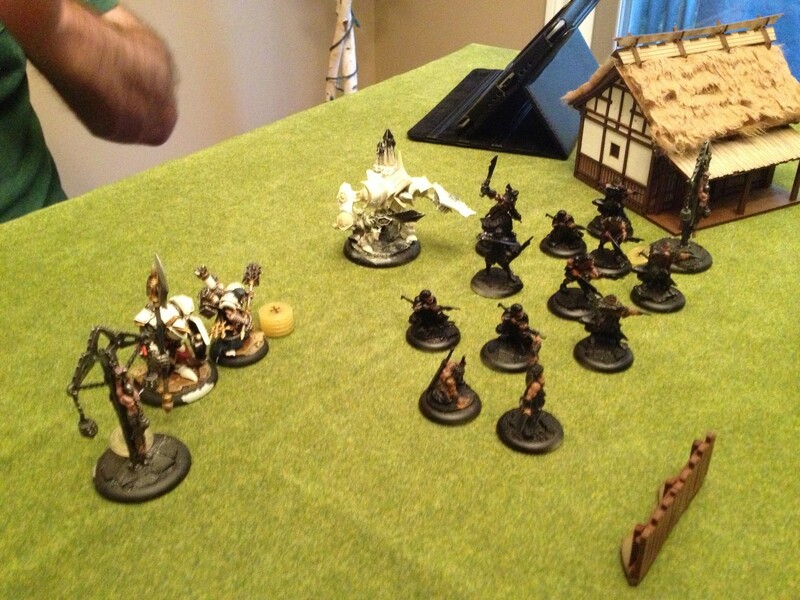 The Zealots go next, Praying for No Spells and pop their mini-Feat. They then run forward… and I make a mistake here… okay, 2 mistakes. First mistake: I didn’t run the closest Zealots actually into melee with the Idrians… not to remove “Go to Ground” (which apparently doesn’t work like “Dig In” in that respect), but to tie up the unit at least. Second mistake: I could’ve had the whole unit in the zone to threaten scoring on Darrell’s turn, but I stupidly had a few just outside… oops. The Choir activates, moves up, and sings “Battle”. Anyway! With a couple of my Zealots in the Reclaimer’s clouds, I activate my Redeemer. It opens fire at my Zealot closest to the Reclaimer, hoping for a lucky scatter. The first and second shot both scatter away harmlessly but the third scatters onto the Devout and Avatar… the shot hits the Devout in its rear, avoiding the shield and inflicting 2 points of damage! Well… not a *good* use of 3 Focus, but hey, better than nothing. The Reckoner activates and walks forward cautiously… I have a 12″ shot and the Avatar has a 10″ charge-threat, but I need to move to the side to be able to tag the Avatar past the wall of clouds… that 2″ region of safety is pretty critical to keeping my Reckoner alive. But this time! This time I nail it, getting the Avatar 11.5″ away from the Reckoner. I boost to hit and damage… Darrell transfers the shot from the Avatar over to the Devout (which gets lit on fire due to me getting a critical hit). 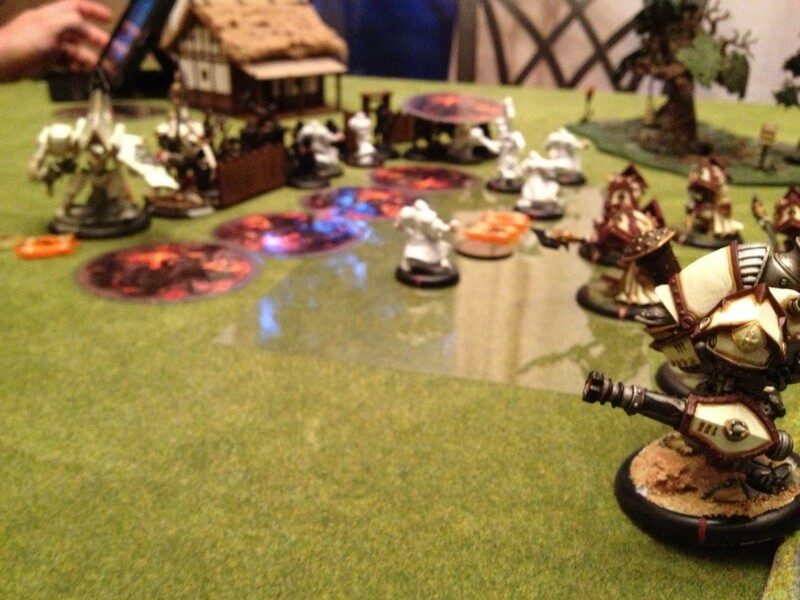 I inflict another 4 points of damage on the sturdy light warjack. 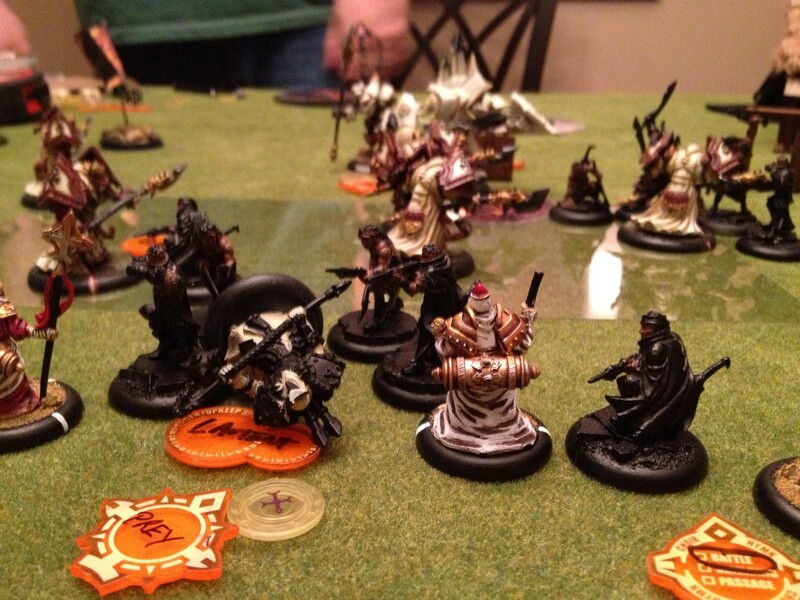 Kreoss goes last, walking forward and camps his last Focus. The Devout refuses to extinguish itself, but my dice abandon me and I fail to wound. Oh well. 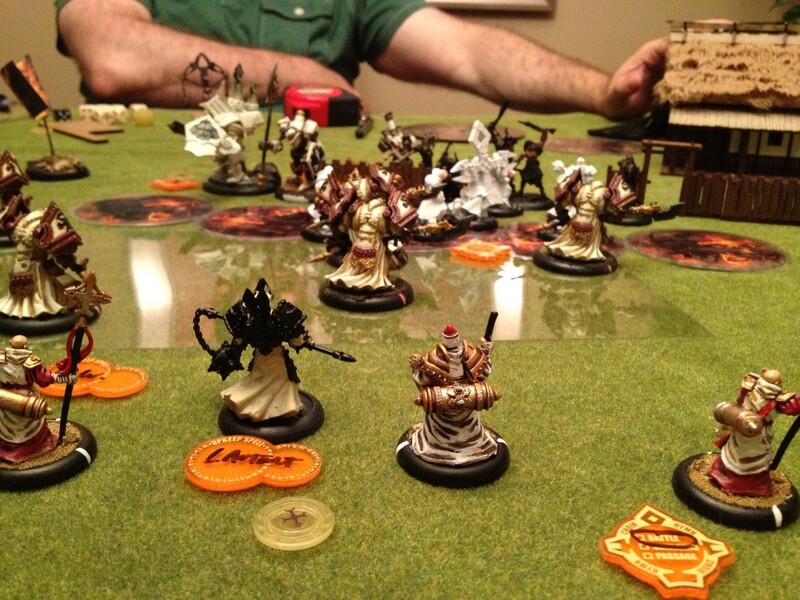 Darrel starts off by camping his full stack, and the Avatar generates 3 Focus again. He starts with the Idrians. They get an “Assault and Battery” order: the 5 closest to my Bastions open fire on them, but between all his attacks he only inflicts 3 points of damage (which I spread out). 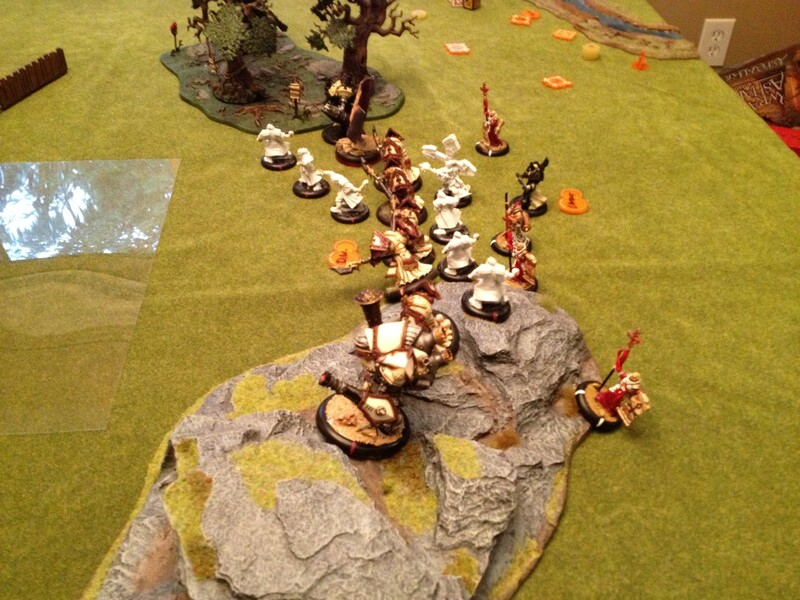 They then charge forward slightly, clumping around my Zealots. The Devout stays put, while the Avatar walks up next to the Devout. Lastly, the Reclaimer moves up a bit (but unfortunately stays just out of 14″ from Kreoss) and pumps out 5 more clouds between the majority of my army and all of his. Sadly, because of my placement issues, I don’t score any points this round… oh well. Okay, that went okay… gotta get models into the zone to start scoring, keep Kreoss safe, and start putting some pressure on Darrel… I think I can manage this. I upkeep both Lamentation and Defender’s Ward, and then allocate 1 to the Reckoner and 3 to the Redeemer. The Reckoner goes first. Yet again I have to move to get around that cloud in front of the Avatar while simultaneously staying more than 10″ away from it… sadly, this time I do not manage and get the Avatar exactly 10″ away (damnit!). Regardless, I hit again and the shot is transferred over to the Devout which is hammered for 8 damage (crippling both arms! Woo!). 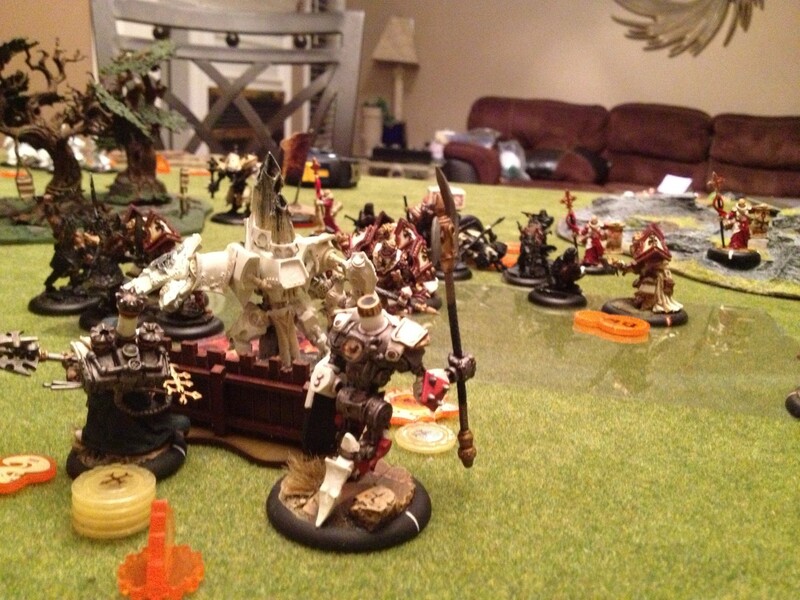 I then activate my Bastions, and run one up between my Reckoner and the Avatar… better him than the Reckoner, right? The rest of the Bastions spread out into the zone so I will actually score points. Next, my Zealots activate, and those that aren’t engaged move up into the clouds. 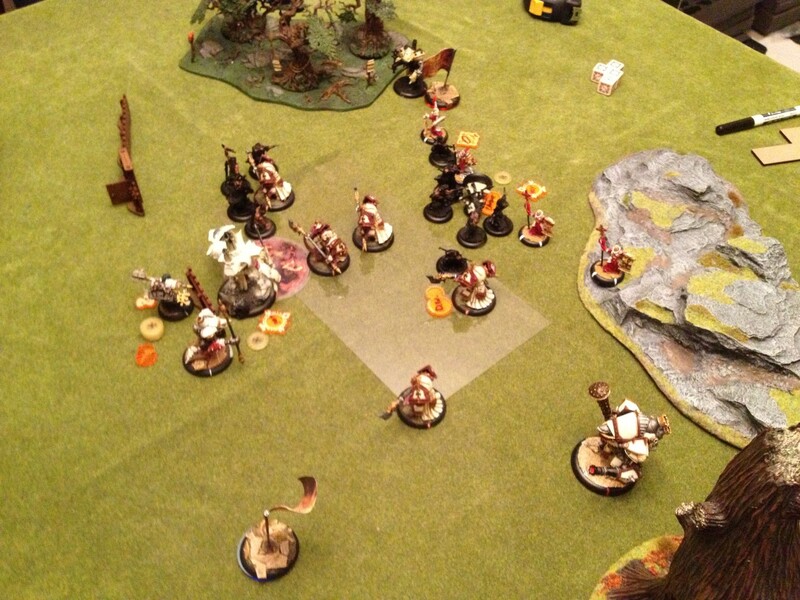 The unit prays for +2 power and hit rolls and start smiting… I manage to kill 3 Idrians with mace attacks, and then have 2 Zealots lob bombs at the Reclaimer kind of as an afterthought… the first misses and scatters onto the Devout and Avatar (unable to wound either), but the 2nd… that bomb HITS! Nice… and then one POW14 damage roll later and the Reclaimer is down 9 points of damage AND I’ve killed 2 more Idrians AND I’ve wounded the Guide! Damn. Those Zealot grenades are legit! The Choir activates and sings Battle again. The Redeemer activates next and opens fire on one of my Zealots still engaged by 2 Idrians… first shot boosts to hit but misses and scatters away harmlessly. The second shot hits, though, and wipes out both my Zealot and both of the Idrians engaging him. Lastly, Kreoss walks up a bit to get the Reclaimer within his CTRL range (no more 1 Focus clouds, thank you very much! ), and I end my turn. I score 1CP for my Bastions controlling the zone! Sadly, it doesn’t happen. The Reclaimer and all the other models on Darrell’s side of the table all extinguish themselves. Boo. At this point the massive stack of Souls that the Reclaimer has reclaimed transform into Focus, giving Darrell at least 12 Focus total (maybe 13? It was a lot). The Avatar generates 2, and we’re off! Darrell activates the Idrians and they get the “Assault and Battery” order again. 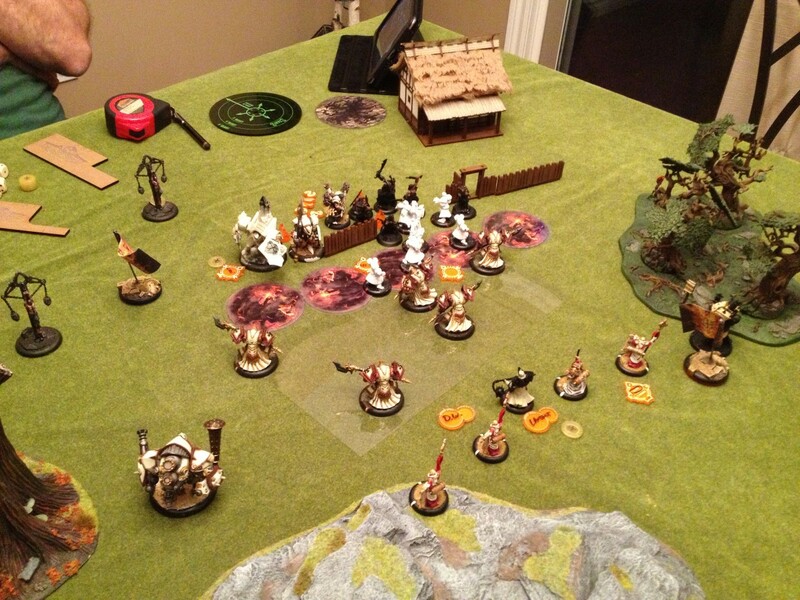 Those 6 close to Kreoss then open fire… but between the 6 attacks, only hit twice (needing only 6s! ), and those that hit both fail to wound! Woo! 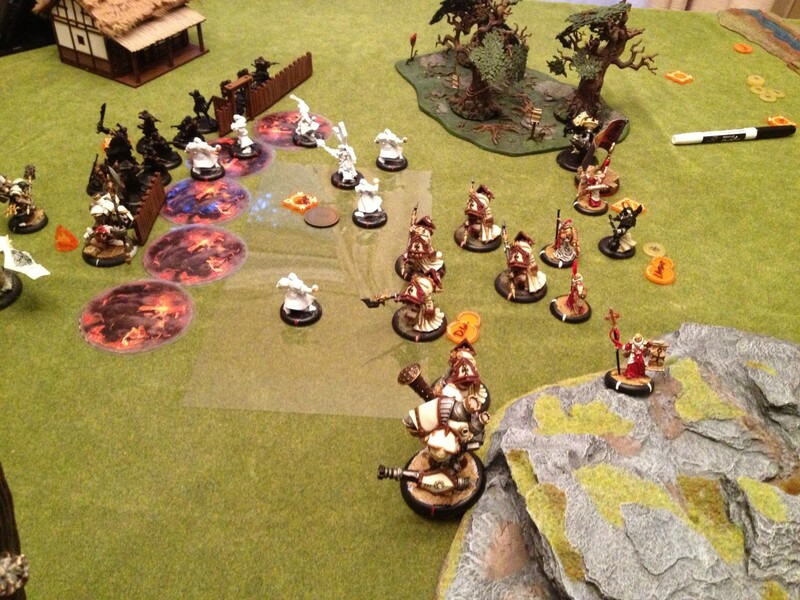 Menoth protects! 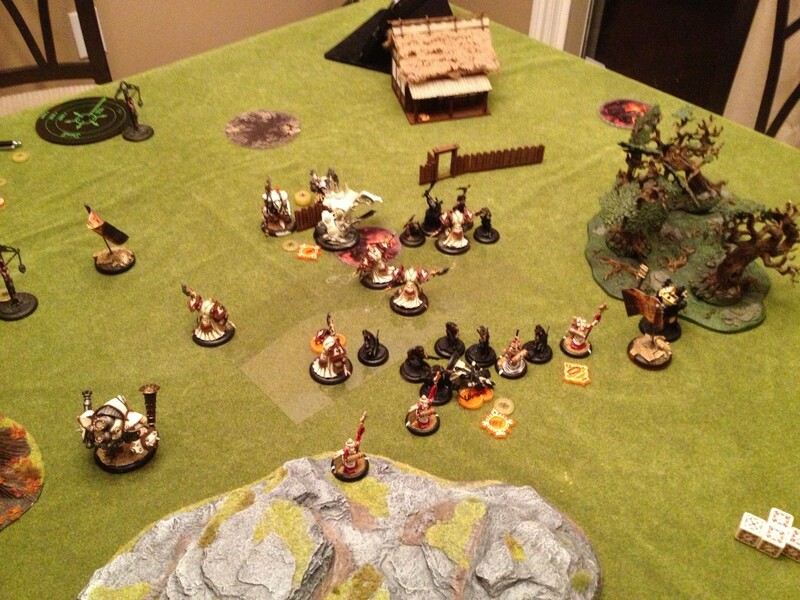 But Darrell starts with the important ones which attacked Kreoss. The first attack… misses! Woo! Second attack hits, and inflicts a very solid 8 points of damage. Third attack (no charge bonus)… misses! Last attack! Rolls! HITS! Gah! Darrell just needs to roll a 9 or better on 3d6… and he nails it. Kreoss drops, and the Reclaimer claims victory! Well, I made a few critical mistakes. First, had I thought of the threat of the assassination, I could’ve placed my Bastions to make sure that it was impossible (or at least ALMOST impossible) to get any unengaged Idrians close to Kreoss. Second, and more importantly, had I realized how legitimate a threat the Zealots posed to the Reclaimer, I could’ve moved Kreoss up earlier, popped his Feat, and then had 6 almost-auto-hitting POW14 bombs to lob at the Reclaimer… especially if I activated the Reckoner first and managed to get the Devout to Shield-Guard the Avatar (as Darrell did). That probably would’ve gotten me the game, since the Zealots would’ve been unengaged by knocked down Idrians. Silly of me. Other than that, though, this was a super-fun game and I learned a lot… and now I have to go buy myself a High Reclaimer. Comments, questions, and mockery are all welcome! 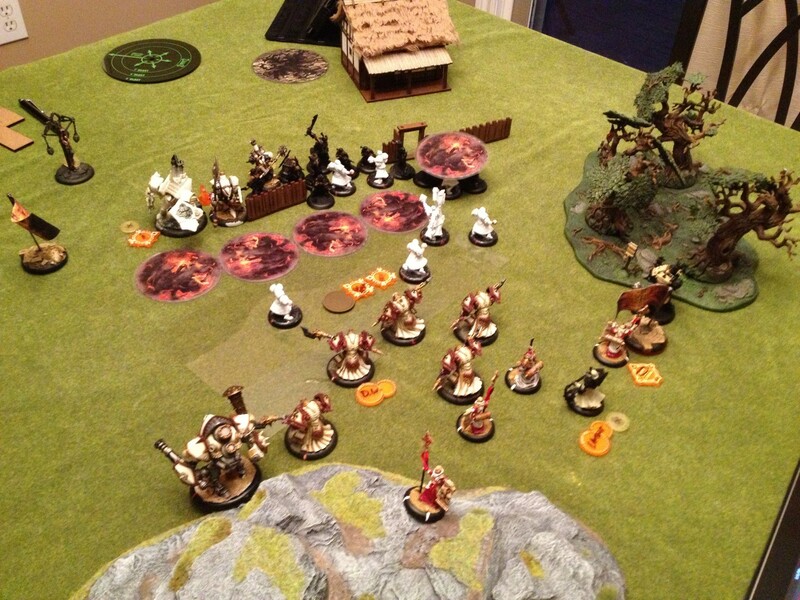 This entry was posted in Battle Reports, High Reclaimer, Kreoss, Menoth and tagged Batrep, IABN, pKreoss, pReclaimer, Protectorate by Marx. Bookmark the permalink. It was a close game. I tried baiting you into popping feat early but to no avail. I assumed that you’d go for the feat turn two to try and bag yourself an Avatar and the Idrians then clean up on scenario or take down the High Reclaimer later on – thus bringing yourself too far forward. As it was I think that it was more a lack of experience vs the High Reclaimer that cost you in that game more than anything else. I don’t think you’ll fall for that trick again! Hmm, that is unless you’d like a rematch with Testament? Hey Menoth Darrell! Thanks for the comments (and for stoppin’ by!). 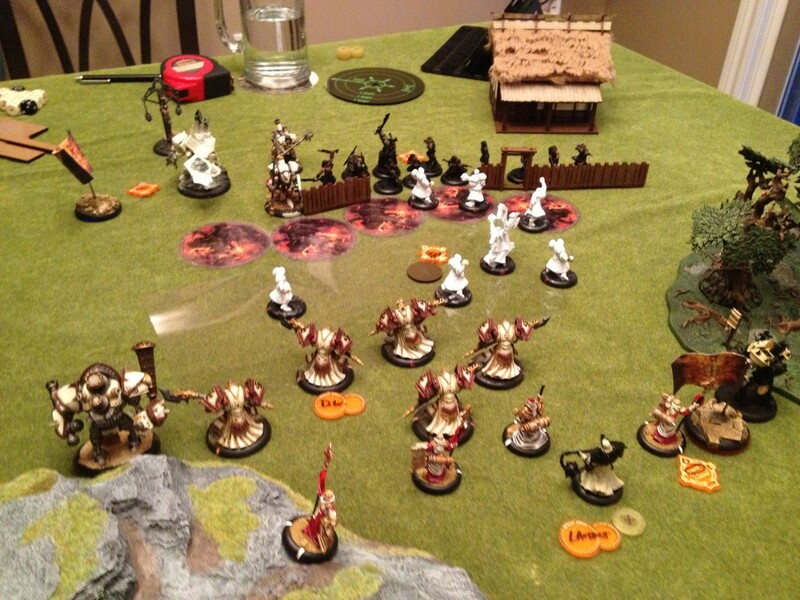 And I would love a rematch… I need to learn about the other Menoth warcasters somehow, and learning from somebody who KNOWS how to use them would be awesome! Also, the Testament and High Reclaimer both seem really cool. Can’t wait to try them myself! Either way, I fumbled this game pretty badly, but this is how I learn… make mistake, repeat, make fewer mistakes. Of course, so far I’ve only done the first two steps of that process… but the theory is sound! Ha! Didn’t even notice it… good catch! 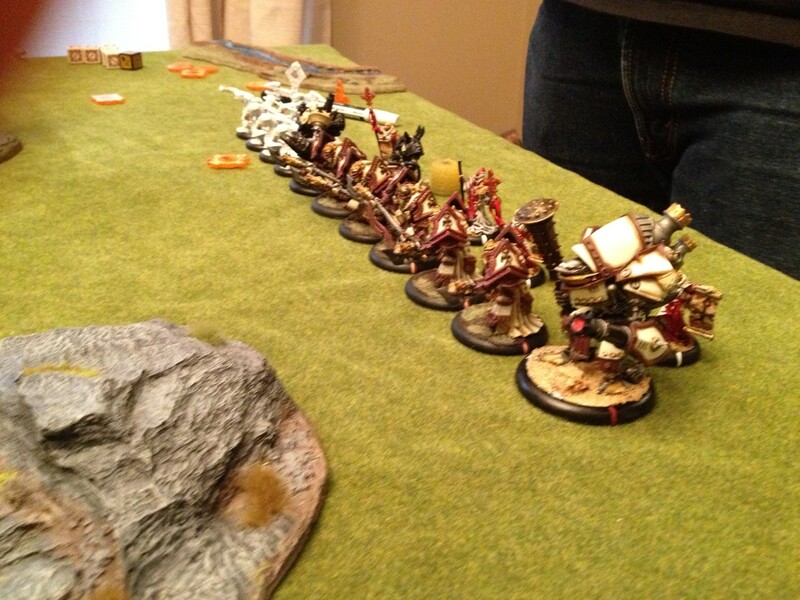 Hey, my Stormwall is awesome. She would’ve loved it. Hey Muffinman, thanks for the question! You may be correct about “Go to Ground” (I’ll have to look it up), but you can *definitely* use the Zealot Mini-Feat before running and still get full benefit. Please note that you MUST declare using the mini-feat BEFORE you run, not after or during. But as long as you say “Okay, I pop my mini-feat and run”, you’re okay. As for the “Go to Ground” thing… lemme look it up real quick… it does indeed work like “Dig In”, which my opponent was under the impression it was not. Small oops, not a big deal. As for Running before Going to Ground, that also works as long as the Guide runs LAST (since GTG is attached to him, the rest of the unit can run, he can pop GTG which will work on all of them, and then if he moves he losses it but the rest of the unit keeps it). Weird rule interactions… thanks for pointing them out, hope that helps clarify! But again, you were completely right about the fact that they would lose GtG if engaged (just like Dig In), which Darrell was mistaken about. Live and learn!